“Arrey, Madamji, who gives their own land to build a mandir, masjid or gurdwara? Of course, they are built on government land, which is grabbed for this purpose…” a criminal lawyer in the Noida district court says laughingly when quizzed about the alleged action of razing a wall purportedly belonging to a mosque on government land that got Sub-Divisional Magistrate Durga Shakti Nagpal suspended and put in the doghouse. At 28, the 2009 batch IAS officer who was 20th on the merit list and who got her cadre changed from Punjab to Uttar Pradesh to be closer to her husband Akhilesh, also an IAS officer, might have been naiive enough to believe that she was sincerely upholding the law. But her seniors in the district say that she may have contributed to creating a law and order problem when she ordered the demolition of a structure coming up illegally on public land. They probably knew that if they did not comply with the verbal orders emanating from the chief minister’s secretariat, the same fate that has befallen Nagpal may have been reserved for them. The way the state government works is as follows: if there is misconduct on the part of a junior officer, the senior officer’s report is sought. Then action is taken. It would be interesting to know what Gautam Budh Nagar District Magistrate Ravi Kumar Singh wrote in his report about Nagpal’s action. Locals say it is not clear whether he tried to defend her. This much is certain: ever since builders descended on Noida and Greater Noida, sand mining along the Yamuna has become big business. The government gives out contracts for sand mining, but enormous amount of illegal mining goes on alongside. Hundreds of dumpers transport sand from the Yamuna riverbed every day and money in lakhs changes hands. Locals say regardless of the nature or colour of the government, miners who have the protection of the local representatives carry on their trade unabashedly; governments come and go but the ‘rate’ doesn’t change. Nagpal was an impediment to this high-level complicity. She took on the sand mafia, ordered the seizure of dumpers and got many offenders arrested last month. Besides, she also deployed a flying squad to rein in the menace. 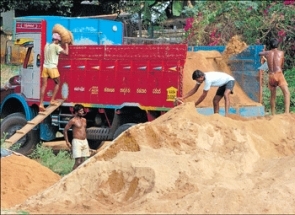 The sand mafia was obviously annoyed and was waiting to even the score. The opportunity came in the so-called demolition of a religious structure. Locals also say an illegal wall on government land was built in a village near Dankaur in Greater Noida. Some say the wall even had a plaque saying Narendra Singh Bhati, the local MLA and minister in the UP government, had laid the foundation stone of the mosque. Others say nobody even knew it was a mosque, it was just a wall. At any rate, Nagpal told residents that it was illegal to build a structure on government land, and it was demolished by residents voluntarily. But her intervention in preventing the sand mafia from its trade has had unintended consequences, for it brought into spotlight, the activities of people who are politically powerful. What’s more, the political subtext and rivalries came spilling out. While Chief Minister Akhilesh Yadav’s uncle Shivpal said the officer needed to be suspended for fomenting religious tension, his other uncle, Ram Gopal, suggested an enquiry be started and the officer be reinstated. For another ‘uncle’, Azam Khan, who is a close associate of Samajwadi Party chief Mulayam Singh Yadav, it was an opportunity to vent out his dislike for Akhilesh. “Ram Raj mein loot machi hai, loot sake to loot (there is mayhem in paradise, make the most of it if you can),” he said. It is the world’s worse kept secret that Azam Khan was extremely critical of Akhilesh being made the chief minister of UP and virtually revolted at the time. All this usually happens when there is a combined deficit of political authority and administrative competence. Surrounded by family, Akhilesh is as hamstrung as Arjun was when he saw all his brothers and uncles standing across him in the battlefield. An enquiry is going on against the contractors Akhilesh’s uncle Shivpal appointed for road building in Etawah and Mainpuri. His half brother Prateek wants to join politics and contest the Lok Sabha seat of Azamgarh, but another Yadav, Balram Singh, already represents the seat. Akhilesh is caught in the vortex of all these crosscurrents. It can’t help that frequently father and son appear not to be on the same page. The UP IAS Association, an extremely powerful body, has taken on the chief minister and has petitioned the government of India against the suspension of Durga Shakti Nagpal. The Lucknow bench of the Allahabad High Court is hearing a petition on her suspension on Friday. UP is under the scanner again.